Our dining experience at Porto Romano was a pleasant one, and rif couldn’t stop talking about it to his friends. After 3-4 days of eating the same dishes (it happens every reunion, 1st day and 2nd day of Chinese New Year), we needed a change and went to Porto Romano for dinner. 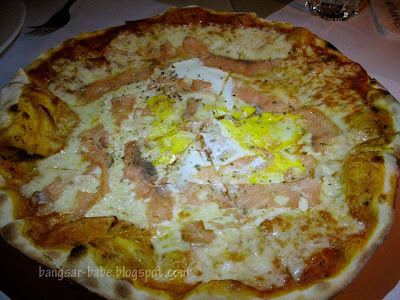 I’ve been eyeing on the smoked salmon and egg pizza (RM34) since my first visit, so no prize guessing what pizza I ordered. The pizza was nicely crisped at the edges and they were generous with the toppings. Each slice was cheesy with plenty of smoked salmon, and the egg added extra creaminess and flavour to the pizza. Towards the end, I was stuffed as the pizza was very rich and cheesy. 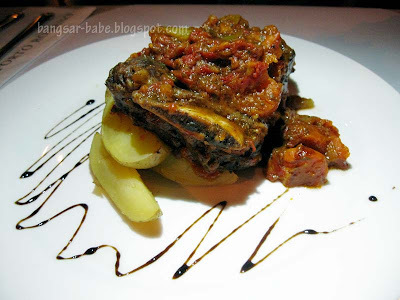 rif’s mum had the spaghetti carbonara (RM29) and his dad, the braised beef ribs (RM39). The former was comfort food at best. 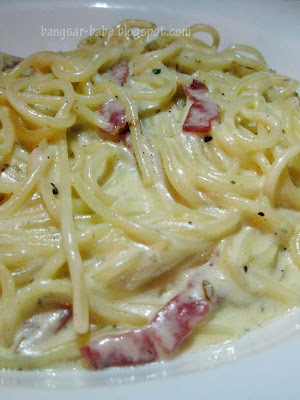 Firm pasta strands, coated with carbonara sauce that was savoury, sweet and rich without being too cloying. The bacon bits could have been saltier, but on a whole, it was not bad. When the beef ribs arrived at our table, it looked so good, I immediately regretted not ordering it. The ribs were tender and meaty — they absorbed the flavours from the marinade beautifully. 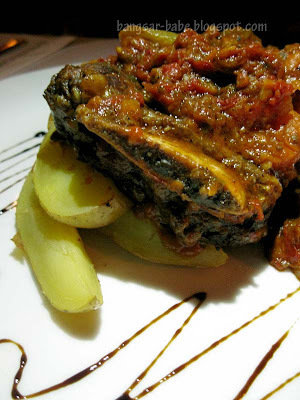 Dressed in a thick and luscious tomato based gravy that was piquant, sweet and savoury, the ribs were incredibly flavourful. The accompanying potato wedges were lightly seasoned with herbs. Not fantastic, but they paired well with the ribs. 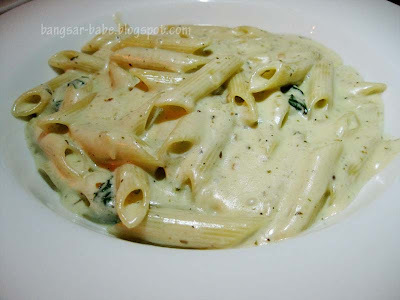 rif felt adventurous that night, and ordered the penne with blue cheese (RM24). It turned out to be an excellent choice; only if you like your cheese pungent. Otherwise, skip this, as the strong smell and taste of the cheese would scare away the faint-hearted. We loved this, but his parents found the flavour too intense. It’s best to share this dish, as it fills you up very quickly. 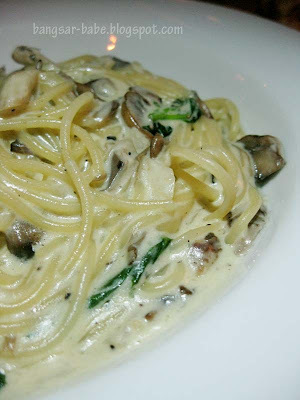 My spaghetti with mushrooms (RM27) came with plenty of gravy so the pasta wasn’t dry at all. It was creamy both in taste and in feel, but also very mushroom-y because the flavour of the mushrooms was well-infused into the sauce. On the downside, service was not attentive. It was very hard to get the waiter’s attention (for more water and getting the bill), and our waiter wasn’t sure of the menu. He fumbled many times while taking our orders. 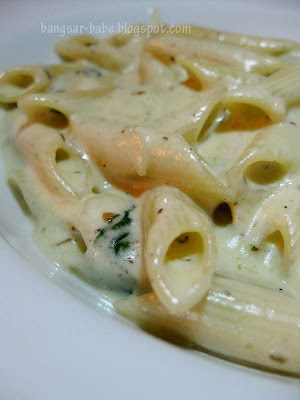 And haha – blue cheese: either you love it or hate it.. I guess it's like gwailo version of durian? Ah Italian again! I <3 to the max! And I'm definitely going to order that pizza with egg on top! Unique! OOoooo!! so good! but looks like i nd to find some kakis..portions r huge! iamthewitch – Go try this and see if you like it! minchow – You can always head there one of these days. Sean – Hahaha…yeah, I don't think I eat anymore Chinese food. It's been one after another these past few days!